'The Square': A cinematic masterpiece or a weak account of a struggling revolution? Academy Awards contender The Square, which chronicles the events of the revolution since its outbreak in January 2011 until president Mohamed Morsi's removal in 2013, has received international acclaim since its release, with the latest being three Emmy Awards on Saturday. Emmy awards recognise excellence in the television industry and in the United States corresponds to the Academy Awards for film, Tony Awards for theatre and Grammy Awards for music. The Square, directed by Jehane Noujaim, is an Egyptian-American production and was shown on Netflix in the United States, hence its inclusion in this year's 66th Emmy Awards nominees list. The documentary won awards for Outstanding Cinematography for Nonfiction Programming, Outstanding Directing for Nonfiction Programming and Outstanding Picture Editing for Nonfiction Programming. The Square was also nominated for the Outstanding Documentary or Nonfiction Special but lost to PBS's JFK (American Experience). The film stars Khaled Abdalla, Magdy Ashour, Aida El-Kashef, Ramy Essam, Ahmed Hassan and Ragia Omran. The Square has also won the Amnesty International Award at the Berlinale and the film's director Noujaim won the prestigious Directors Guild Award. 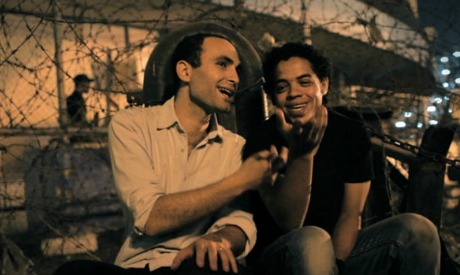 In spite of the international acclaim the documentary has received abroad, it has never been released in Egyptian cinemas. A planned screening during the 6th Panorama of the European Film in 2013 was cancelled due to difficulties in getting the needed permissions from Egyptian censorship authorities.